It's hard not to be seduced by the name of these alcoholic chocolate bits: Rum Brownie Truffles. I love rum. I love chocolate. So what's not to like? Despite their fabulous name and their appealing exterior, I did not like them very much once I started eating them. I don't know exactly what it was that I didn't like, but it caught completely me off guard. I served them to a few people to see if my opinion was shared: it was. Nobody liked them, in fact, I threw them away immediately (something I rarely do with food). And now the very painful rating: 1 out of 5. At least they make a very pretty decoration! - Preheat oven to 350. Coat a 12-by-17-inch rimmed baking sheet with cooking spray; set aside. Melt butter and chocolate in a small heatproof bowl set over a pan of simmering water, stirring occasionally. Set aside. - Whisk together eggs, brown sugar, vanilla, and salt in a large bowl. Stir in chocolate mixture, then fold in flour. Pour batter into prepared baking sheet. Spread evenly with a rubber spatula. Bake until top is shiny and a cake tester inserted into center comes out with some crumbs attached, about 20 minutes. Let cool completely on a wire rack. - Break up brownie into small pieces; transfer to the bowl of an electric mixer fitted with the paddle attachment. With machine on low speed, pour in rum, and mix until crumbs start to come together to form a ball. - Shape into 1-inch balls, and roll in sanding sugar to coat. Transfer to a baking sheet; refrigerate, uncovered, until cold, about 2 hours. Serve chilled or at room temperature. Truffels can be refrigerated in an airtight container up to 1 week. I went a little crazy with my sprinkles cabinet. I think it's the rum that made me do it. PS : I'M DYING to enter ur giveaways, but i live in Indonesia, so far away from us and canada. :'( love the frosted cupcake, pink chocolate aprons and the non stick donut pan! these REALLY caught my eye!! That's too bad they didn't taste good! Maybe it's the rum and chocolate? Maybe not. I tried a rum cake in Florida and it tasted pretty good.. maybe you should make that next time! A shame the taste wasn't as good as their look. I've tried many different ways of creating truffles, & have found the best (for me) is to use a basic chocolate ganache recipe (chocolate & cream). Or I have made rum truffles using stale cake crumbs, mixed with melted chocolate & cream. I'm totally seduced and they are not even in front of me. They look amazing. They are pretty...sorry the taste didn't work out. Well, they're cute, at least you've got that! 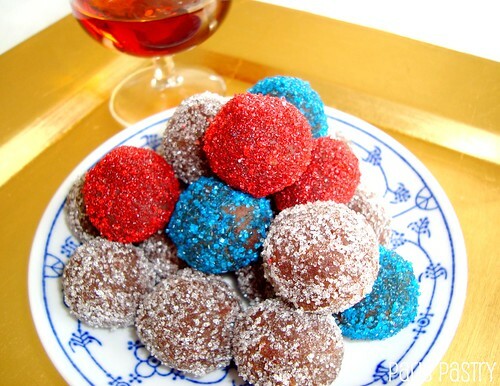 Maybe ganache truffles would turn out better with the rum! I mean Rum & chocolate - could I resist a combination like that--definitely not. too bad they didn't taste good, they totally sounded fab!! I love how you decorated them!! That's too bad! I got exited when I saw the pictures. Wow! wow!wow! I love your blog. 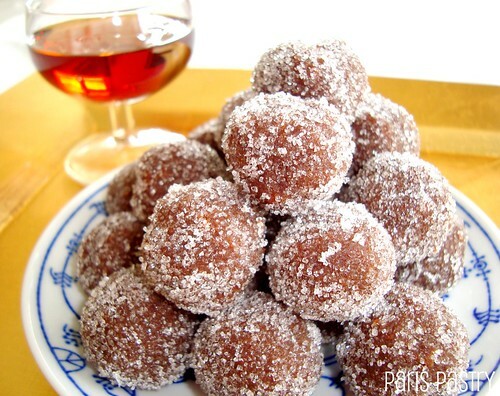 I'm your new follower, Caro B.
I had the same experience when I made bourbon balls, looked good but were pretty much inedible. I haven't attempted another alcohol ball since. 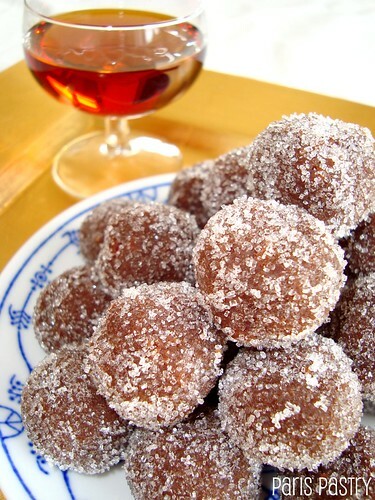 Its such a shame, they look gorgeous, I actually thought they were little doughnut holes at first. These look so impressive but sound very easy to make. 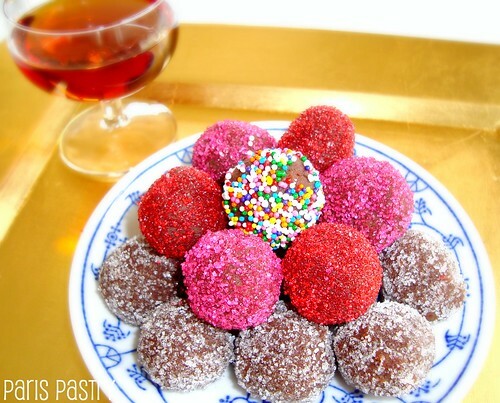 I want to try this with all sorts of stuff now, just like those cake truffles I keep seeing posted. I need to try...love all the sprinkles!